130-year-old collaborative space brings you an exhibition of illustrated posters, sculptures and design objects by two Berlin-based artists, Allen Shaw and Stuart Wolfe. While Allen is an Indian artist, illustrator and storyteller, who works essentially with watercolours, Stuart is an English sculptor, designer and artist who works mostly with metal. 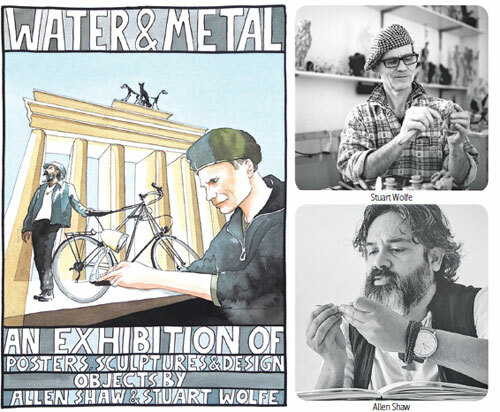 Allen and Stuart met at the International Bicycle Fair called VELO in Berlin in 2014 and since then have been collaborating on various projects including this exclusive ‘Water & Metal’. Their diverse backgrounds make their collaborative work interesting and diverse, yet if one looks hard enough there’s a common thread: be it their love for bicycle-related art or the knack to tell a story with a line, a colour or an object. For Allen, a visit to India always feels like homecoming and he had participated in a residency at The Project Café earlier, but for Stuart this will be a very special occasion marking his return to India after having spent a part of his childhood here. It is also his very first show in India. The exhibition Water and Metal showcases “blamps” by Stuart, which are reading lamps made out of bicycle parts in addition to a collection of small bronze sculptures alongside a series of illustrated posters titled Goa Blues by Allen. This being Allen’s interpretation of Goa in a style reminiscent of the 1920s infused with his observations of the bicycle culture here. The Project Café Goa is a 130-year-old Portuguese villa in discerning area of Assagao. The space is committed to four segments of food, design, retail and a superlative stay experience. The place is an innovative, artistic sanctuary, which has given birth to an altogether new idea that is ever evolving.